Recently I had to buy a Ink Cartridge for our hp printer. 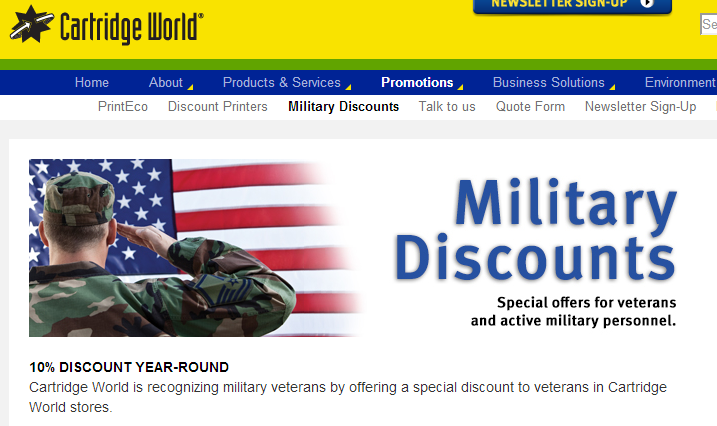 I checked around and found that Cartridge World offers a 10% off discount for Military Members. They required a military ID card at checkout. Click here to visit their website. For my home printer, the cost there was about $11 for refills or $21 for XL refills. Another option if looking to get a ink refill is Walgreen's. I've heard they offers a 15% discount to military members on Tuesdays. Went to Little Caesars last night in Southern Pines, North Carolina. 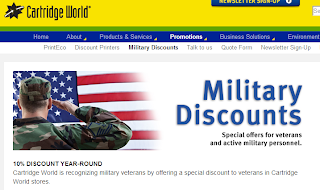 They offered a 20% military discount!! That made the $5 Hot & Ready only $4. I know other Little Caesars offer similar discounts of 10%. Varies location to location so just remember to ask. They also always offer free Crazy Bread on Veterans Day.